The Shield nickel coin was the first U.S. five-cent piece made from copper-nickel, the same alloy of which American nickels are struck today. The Shield nickel coin was issued from 1866 until 1883, when it was replaced by the Liberty Head nickel. 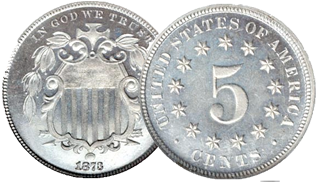 The coin takes its name from the motif on its obverse, and was the first coin referred to as a “nickel”—silver five-cent coins had been known as half dimes.